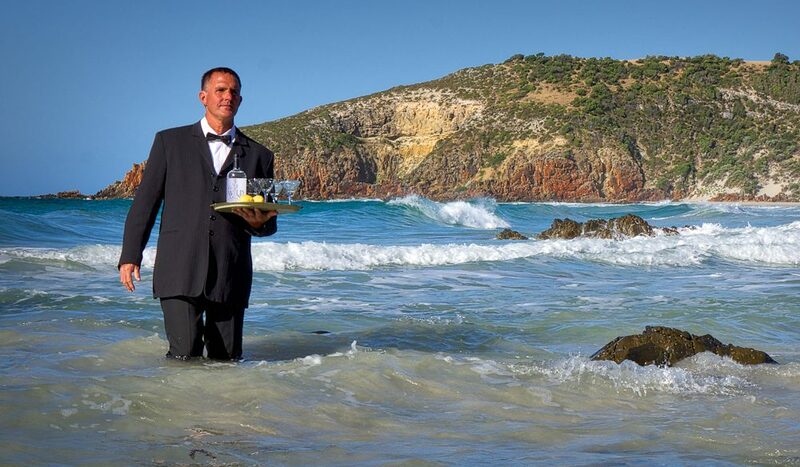 Bond, James Bond, wades into Kangaroo Island's FEASTival. Who dreams up experiences like this? Sorry to spoil the surprise, but at this year’s ‘View to A Kill’ event, you may find yourself accepting a martini from a tuxedoed waiter casually making his way out of the surf, as you and your fellow lunch-goers relax on the sand, draped in furs and long white gloves (provided for your comfort… and fashion, darling). The James Bond theme is an apt one for this particular afternoon, which will see you partake in a long, long lunch complete with pop-up casino, held in a futuristic ’70s pad overlooking Snellings Beach. Receive chips to play with at the beginning of the day, and use your winnings at its end to bid at an auction for a two-night stay on-site, so you can draw out the action even further. (BYO pearls.) A View to Kill will be held Saturday 2 May, from 1–4pm, $132.50 per person. 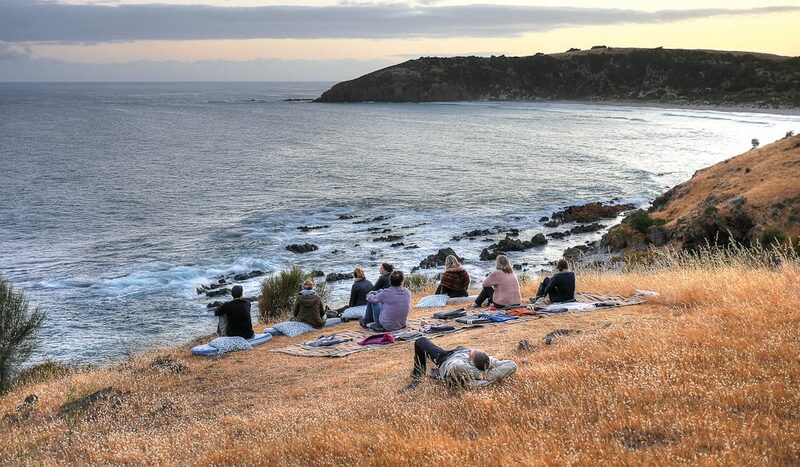 Breakfast with the birds: Kangaroo Island FEASTival. Sprawl, cup of tea in hand, on blankets and cushions placed around cities of long grass and watch the light in the sky change in luminous slow motion to a rosebud pink artwork dotted with dove-coloured clouds. On Kangaroo Island you can spot sea lions flopping about on white beaches, koalas a-slumber in the eucalypts and wallabies scratching in the dirt. But this morning, it’s all about watching the birds while enjoying the dawn break over farmland, scalloped by wire fencing and dotted with trees waving wildly abdicating limbs, followed by a white-tableclothed breakfast served under the gumtrees. Breakfast with the Birds will be held on Sunday 3 May, from 6am–8am, from $67.50 per person. Far from being a rarefied dining experience, FEASTival’s ‘Table Surfing’ concept encourages visitors to buy tickets to a meal in a local’s own, lovely home (such as this one, pictured right, which is found virtually on top of Brown’s Beach). Aside from the guarantee of good food and wine, we like this idea for its money-can’t-buy cred: locals are offering up seats in homes that are serving everything from low-key barbecues to Masterchef-style degustations. Confirmed gastronomes need only apply. Table Surfing events will be held throughout the eight-day festival, from $35 per person. KI Island Pure haloumi on the sizzle. A sheep farm is an accountant’s nightmare and a food romantic’s dream. 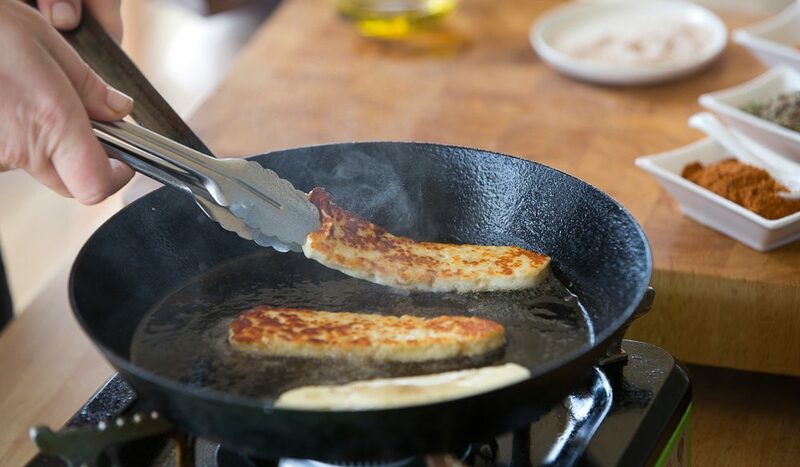 You’ll understand why, once you’ve eaten Island Pure Sheep Dairy’s haloumi, which is so heavenly it’s worth paying the ferryman in itself. Discover stories behind producers like this at the Picnic of Biblical Proportions, which is held on-site at Island Pure’s verrrry pretty dairy, and showcases a bounty of local food producers to boot. South Rock Lamb chorizo, Dan’s sticky figs and award-winning honey will make this a religious experience. Picnic of Biblical Proportions will be held Friday 1 May 2015, 12:30pm–3pm, for $67.50 per person. ‘Cook’s Companion’ guru Stephanie Alexander. She’s reason enough to come on her own, isn’t she? 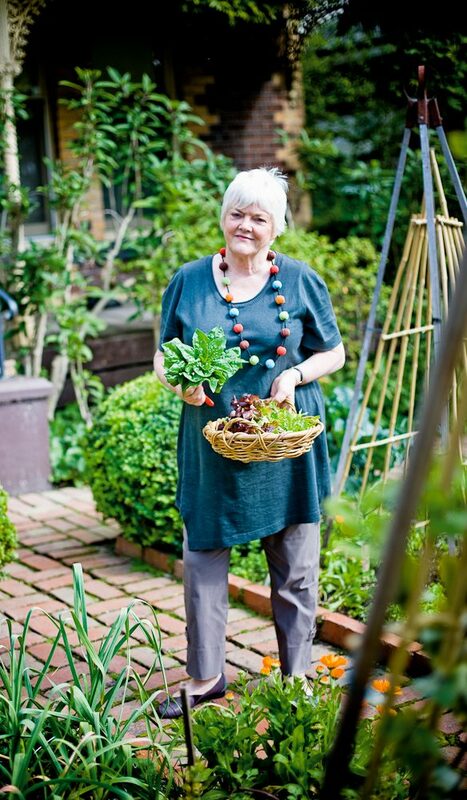 The national treasure will be hosting the festival’s launch dinner, aka ‘The Enchanted Garden’, where you can harvest your own herbs from tableside garden beds to eat alongside your meal. (Stephanie has contributed to the menu, so you know it’s going to be good.) Read more from Stephanie on p128 – or simply meet her in person during this fairly delightful week. The Enchanted Garden will be held on Friday 1 May 2015, 6:30pm–11pm, $160.50 per person. See sealink.com.au/ki-feastival for more details on the entire week.